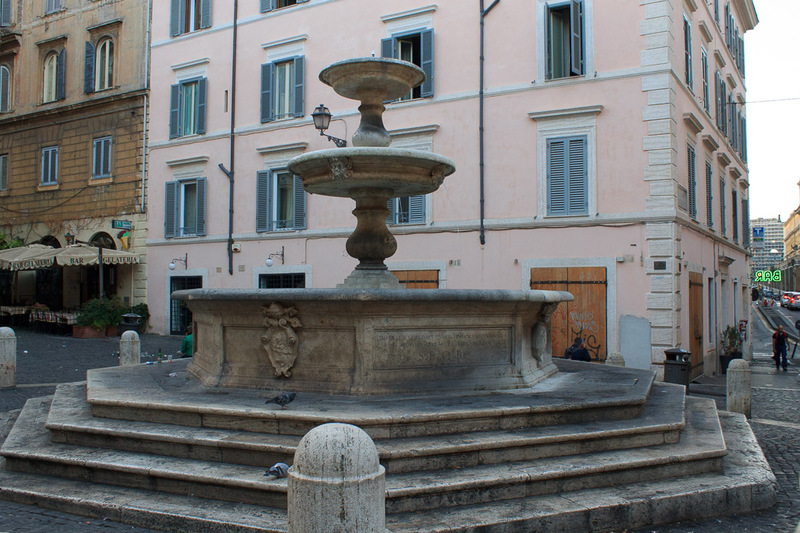 Fontana dei Calecument (1st photo below), also known as Fontana di piazza della Madonna dei Monti, is the simple two-tiered Renaissance fountain with a few leering grotesques, located in Piazza della Madonna dei Monti. It is named for the Collegio dei Catecumeni, an imposing building of 1635 which stands on Via della Madonna dei Monti a short distance from the piazza. 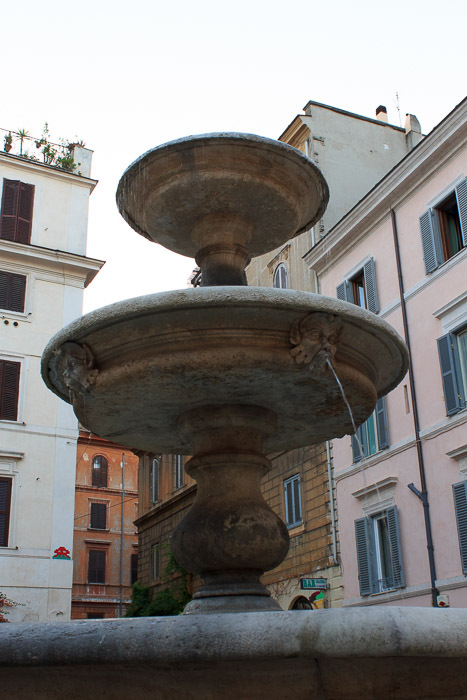 The fountain was commissioned by Pope Sixtus V in 1588 and was completed in 1589. It is an octagonal travertine basin with four of the sides adorned by the coats of the Pope and the municipality. It is horizontally levelled on the sloping piazza with 4 steps which are of the same octagonal shape as the basin. In the center of the basin is a baluster supporting a round basin which has grotesque masks on the edges (3rd photo below). Water originally gushed from a tall vase at the center of this upper basin, but at the end of the 17th century the vase was replaced with a second baluster and basin, smaller than the lower one, from which the water nowadays runs. The piazza and fountain are a popular gathering point for people and families all day long but the character changes during the evening. 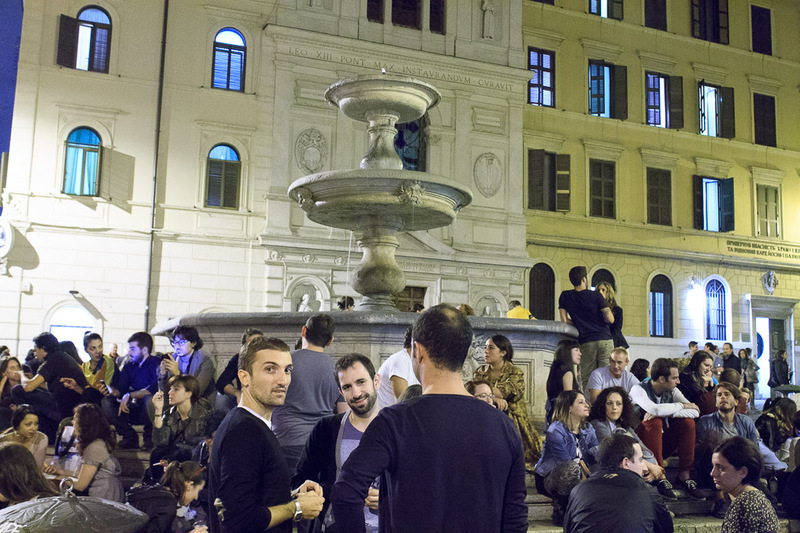 Young people congregate every evening around the fountain, and consume large amounts of alcohol from nearby bars (2nd photo below). This is definitely a popular party fountain at night! Across Via dei Serpente is the beautiful neighborhood church of Santa Maria ai Monti. See all Fontana dei Calecument photos.